An avid athlete, Aaron was introduced to baseball when he was just four years old and continued to play until his sophomore year in high school. A pitcher and first baseman, he played on two All Star teams, in 2003 and 2005. His Cal Ripken baseball team won the league championship. In 2005, he was diagnosed with two aggressive, malignant brain tumors that ransacked him physically. Still he played on his varsity high school golf team and was one of five starters his senior year. Now 23 years old, he remains an avid golfer, scoring 84 on average with a 13 handicap. 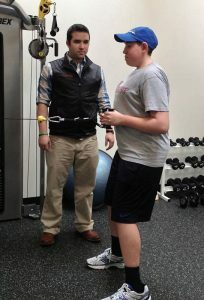 Our original Adventure Project grant recipient, he continues to receive fitness resources through this critical program. His story: “I struggled for years trying to find a wellness center that truly understood how to approach and improve a cancer survivor’s overall health and well-being. Since the age of ten years old, my body had been severely ravaged due to a series of surgeries and treatments for a rare and aggressive form of brain cancer. As a lifelong athlete, I spent countless hours with various trainers to help rebuild and strengthen my body, but the results were uneventful. It became a very frustrating process for me until the fall of my senior year in high school when my mom and I discovered the Mission Training Center. His short-term athletic goal: “To keep improving my game of golf through practice and working out.